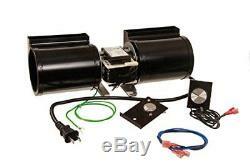 Fireplace Blower Fan Kit with Speed Control Knob Temperature Controlled 180 CFM. Measurements: 4-1/2 inch High x 12-3/4 inch Long x 4-1/2 inch Wide. Increased CFM provides more air movement. Includes Magnetic Mounting Strips for quick mount installation. ETL certified to CSA C22.2 & UL-1004. Includes power adapter and all necessary wires. This Skytech brand blower would be an exact replacement/compatible blower to blower model number GFK-160A which fit into several models of Heat & Glo Brand Fireplaces. The FK-180-RT blower is a temperature controlled fireplace blower fan kit that is designed to circulate warm air through your room more efficiently. It has 120VAC, 60 Hz power, and increases the amount of air the fan will circulate through your room from the gas appliance. The increase in circulation will get up to 180 CFM (cubic feet per minute) and allow the room temperature to heat quicker, as well as maintain a consistent temperature. The improved energy efficiency of your appliance will save on your energy costs too. The temperature sensor will allow the blower fan to automatically turn on when the temperature sensor reaches 110°F and off when it drops below 90°F. For any additional information or questions, please message us. Our company hours are 8-4 CST Monday thru Friday. We pride ourselves on carefully packaging orders and we want our customers to have the best shopping experience we can provide. We strive to sell quality products at a fair price, and provide the best customer service. Our customers are important to us, and we love to hear back from them. Tracking numbers are posted back to your order once they have been processed. If you received a broken or damaged item, please contact OnFireGuy right away. The item "Fireplace Blower Fan Kit with Speed Control Knob Temperature Controlled 180 CFM" is in sale since Monday, November 27, 2017. This item is in the category "Home & Garden\Home Improvement\Heating, Cooling & Air\Fireplaces & Stoves\Replacement Parts". The seller is "onfireguy" and is located in Elysian, Minnesota.